A studio apartment need not be cramped, ugly, nor drab. In this urban contemporary setting, the walls are all painted a light grey for uniformity and to create more space. Furniture choices are important, as we can see—chair and side table legs are skinny, and so are the shelf supports. 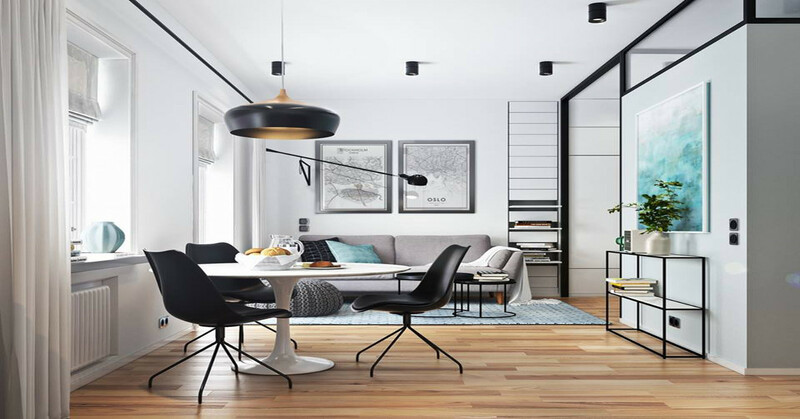 Eclectic and modern, things are kept mostly simple with a small color palette of black, white, grey, and blue. An eye-catching Ottoman and carpet in the living room help switch things up at just the right amount, leading into the bedroom through an arched, black doorway. Plenty of natural light comes streaming through the windows, that have space for you to chill on should you choose. The light even reaches the bathroom, with glass windows built in and around the room’s ceiling. Wooden flooring in pine help keeps things real, should concrete living get too much for this city dweller.